Keep your WeatherTech FloorLiners and FloorMats looking and feel new! 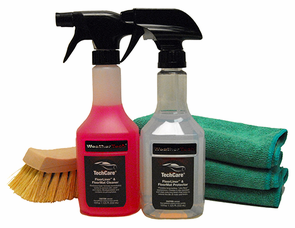 WeatherTech TechCare FloorLiner and FloorMat Care Kit includes the products needed to keep your WeaterTech FloorLiners and FloorMats looking as new as the day you bought them! Specifically manufactured for the care of WeatherTech FloorLiners and FloorMats, the TechCare Cleaner cleans dirt, mud, stains, and more from the surface, while the TechCare Protector leaves a coating behind to keep them cleaner longer and for easy maintenance. If you�ve already invested in custom FloorLiners or FloorMats, be sure to keep them in perfect condition with the WeatherTech TechCare FloorLiner and FloorMat Care Kit! WeatherTech TechCare FloorLiner and FloorMat Cleaner: WeatherTech TechCare FloorLiner and FloorMat Cleaner is a custom made product specifically designed to clean your WeatherTech FloorLiners and FloorMats. The biodegradable, and eco-friendly formula quickly removes dirt, stains, and scuffmarks from your FloorLiners and FloorMats without affecting the finish or quality. If you have WeatherTech FloorLiners or FloorMats, the WeatherTech TechCare FloorLiner and FloorMat Cleaner is a must! WeatherTech TechCare FloorLiner and FloorMat Protector: WeatherTech TechCare FloorLiner and FloorMat Protector is a custom made formula specifically designed to impart a strong, durable coating to your WeatherTech FloorLiners and FloorMats. This protective coating resists scuffs, marks, staining, and the degradation of everyday use. WeatherTech TechCare FloorLiner and FloorMat Protector dries to an anti-slip finish, leaving your FloorLiners or FloorMats protected and looking like new. The Natural Tampico Upholstery & Carpet Scrub Brush is made of tampico bristles, which are highly resistant to chemicals and have a perfect texture for scrubbing carpet and upholstery. The sturdy bristles help eliminate stubborn stains to leave your vehicle�s interior clean and comfortable. Use the Natural Tampico Upholstery & Carpet Scrub Brush for tough staining on your WeatherTech FloorLiners and FloorMats. A total retail value of $43.95. Save $8.96!